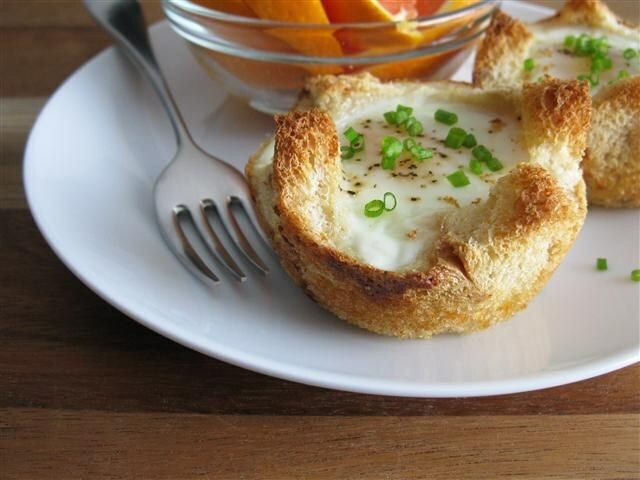 Baked eggs turn out much less calories than fried. So they can have even for those seeking to lose weight. In this form the eggs, you can add a variety of delicious and wholesome ingredients, each time creating a new dish. A great option for a hearty Breakfast will be eggs baked with vegetables in special ceramic bowls or pots. For their preparation it is enough to break every mold 2 to 4 eggs, add some cream, chopped tomato, onion and greens. All you need to salt and put in oven preheated to 200oC. When eggs are lightly set to desired consistency you can get them and to bring to the table. As additional ingredients, you can use any other vegetables, such as zucchini or eggplant, a little stewed in the pan. Go perfectly with eggs are mushrooms, ham, any cheese, arugula and other greens. If no special refractory ware, you can bake eggs in a large potato. In this case, it should be boiled in their skins until almost done, then peeled, cut lengthwise into two halves and get out of the middle of each using a teaspoon. Then to add salt to the product, break an egg into it, sprinkle all herbs and place in the preheated oven for 10 minutes. Similarly, you can bake eggs and zucchini. Only it should not boil, but first to cut, remove the core, put on 15 minutes in the oven, then get it, add salt, split in halves vegetable egg and return to the oven. The dish can be sprinkled with grated cheese and greens. Get hearty, tasty and at the same time not too high-calorie lunch. Eggs can also be cooked in the oven and a thick slice of bread. It should be pre-fry in a pan with olive oil and garlic. Then very carefully break egg and place in oven for 5 minutes. Bake eggs in the oven in the shell. To do this, they need to wash, dry, pierce with sharp and blunt end of the needle so that they are not cracked in the cooking process, then put on a baking sheet and place in oven preheated to 200oC. To eat soft boiled eggs would be enough to leave them be prepared in 5 minutes, and to get hard-boiled eggs is to hold them in the oven for about 10 minutes. When you do this a couple of times they have to turn over so they are cooked evenly. Even more tasty eggs, baked in the ashes. For this the crude product should be tightly wrapped in foil and buried in hot embers. After 7-10 minutes it will be possible there. In this way they will compete with even flavorful baked potatoes.